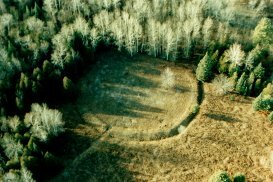 Combining his interest in archaeology and anthropology with a love of the great outdoors Michigan resident Doug Masselink has discovered a number of precise alignments between Native American earthwork circles and mounds in his home state. By the use of hand held Global Positioning Receiver he began to notice that the latitude and longitude of some of the sites he visited were the same, suggesting that perhaps the structures had been deliberately aligned with one another. He continued to test his hypothesis by using the Global Positioning System to locate the positions of those earthworks that still remain and for those that have been destroyed but had been recorded in the archaeological literature. In many cases Doug was able to show that many sites were accurately lined up over considerable distances. Some alignments are cardinal (i.e. N-S, E-W) and remind us of Alfred Watkins' cardinal point alignments in Cambridgeshire and those of Wilhelm Teudt in Germany. 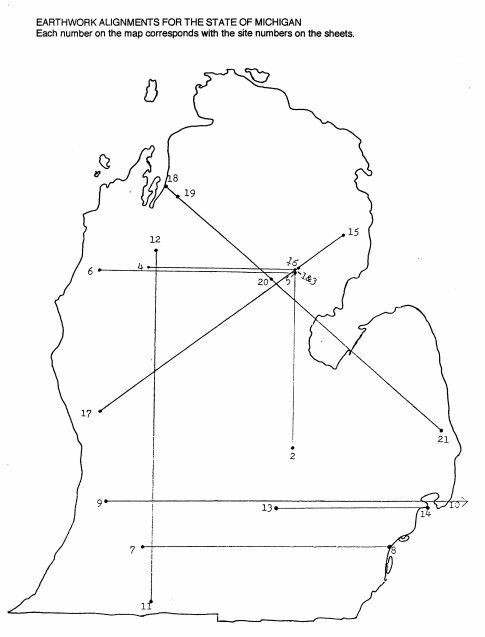 Doug has allowed SOL to present here some of his Michigan alignments. These alignments involve actual prehistoric earthworks. The academic community generally accept that these sites have a sacred character. More importantly, they are still watched over, maintained and revered by Michigan Native American Indian Communities, who have ancestral connections to these sites going back thousands of years. Most of the aligned earthwork enclosures are circular with an average diameter of 200 feet. Some are square and some of a horseshoe shape. Ancient Michigan was on the periphery of the Hopewell/Adena culture whose cultural centre was in the sate of Ohio. Alignments in this state are currently under investigation by Doug. Each site reference has been given a number that corresponds to the number on the alignment map. Each location reference shows the literary source and the USGS topographical map index. All USGS topos used in this report are absed on the North American datum 1983, 1:24000 scale. The USGS topos make use of section numbers. Each section is about one square mile. These sections are broken down into quarter sections which are in turn broken down into halves or quarters and so on. The historical documents often refer to a site, for example, as the W½ of the NW¼ of the SW¼ of Section 10. This would put the earthwork enclosure within a 20 acre piece of ground. So even though an earthwork enclosure no longer exists its former location was often reported and filed with the state using the above method. Where a site is referred as GPS, that means that the earthwork is extant, but is not shown on the USGS topographical map. In these cases Doug has visited the site and used a GPS receiver to obtain the co-ordinates.